Benevite Nutraceuticals™ Squalene is a major component of skin surface lipids such as sebum, where it assists in maintaining healthy skin. 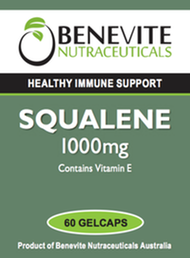 Squalene 1000mg may assist in the maintenance of a healthy immune system and in the maintenance of general wellbeing. Adults: Take 1capsule daily, with meals, or as directed by your healthcare professional. Squalene is a major component of skin surface lipids such as sebum, where it assists in maintaining healthy skin. 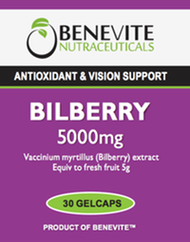 May assist in the maintenance of a healthy immune system. Squalene is a natural organic compound originally obtained for commercial purposes primarily from shark liver oil, though plant sources (primarily vegetable oils) are used as well, includingamaranth seed, rice bran, wheat germ, and olives. All plants and animals produce squalene, including humans. Squalene has been proposed to be an important part of the Mediterranean diet as it may be achemopreventative substance that protects people from cancer. Squalene is a hydrocarbon and a triterpene, and is a natural and vital part of the synthesis of cholesterol, steroid hormones, and vitamin D in the human body. 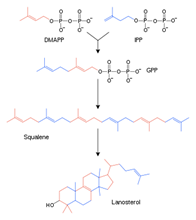 Squalene is used in cosmetics, and more recently as an immunologic adjuvantin vaccines. Squalene is the biochemical precursor to the whole family of steroids. Oxidation (viasqualene monooxygenase) of one of the terminal double bonds of squalene yields 2,3-squalene oxide, which undergoes enzyme-catalyzed cyclization to afford lanosterol, which is then elaborated into cholesterol and other steroids. Immunologic adjuvants are substances, administered in conjunction with a vaccine, that stimulate the immune system and increase the response to the vaccine. Squalene is one of those adjuvants., The New York Times, September 21, 2009.</ref> It is added to improve the efficacy of several vaccines, including pandemic flu and malaria vaccines. This includes several European countries, which use these formulations in their 2009 flu pandemic vaccines. An adjuvant using squalene is Novartis' proprietary adjuvant MF59, which is added to influenza vaccines to help stimulate the human body's immune response through production of CD4 memory cells. It is the first oil-in-water influenza vaccine adjuvant to be commercialized in combination with a seasonal influenza virus vaccine. It was developed in the 1990s by researchers atCiba-Geigy and Chiron; both companies were subsequently acquired by Novartis. It is present in the form of an emulsionand is added to make the vaccine more immunogenic. However, the mechanism of action remains unknown. MF59 is capable of switching on a number of genes that partially overlap with those activated by other adjuvants. How these changes are triggered is unclear; to date, no receptors responding to MF59 have been identified. One possibility is that MF59 affects the cell behavior by changing the lipid metabolism, namely by inducing accumulation of neutral lipids within the target cells. An MF59-adjuvanted influenza vaccine (Fluad, developed by Chiron, which contains about 10 mg of squalene per dose) has been approved by health agencies and used in several European countries for seasonal flu shots since 1997. However, the Food and Drug Administration has not authorized the use of such adjuvants in the United States.Glaxo Smith Kline used the squalene-based AS03 adjuvant in their 2009 influenza pandemic vaccine Pandemrix andArepanrix. A 2009 meta-analysis by researchers at Novartis Vaccines and Diagnostics that was published in the journal Vaccine brought together data from 64 clinical trials of influenza vaccines with the squalene-containing adjuvant MF59 and compared them to the effects of vaccines with no adjuvant. The analysis reported that the adjuvanted vaccines were associated with slightly lower risks of chronic diseases, but that neither type of vaccines altered the rate of autoimmune diseases; the authors concluded that their data "supports the good safety profile associated with MF59-adjuvanted influenza vaccines and suggests there may be a clinical benefit over non-MF59-containing vaccines".